There's an awful lot to digest in Ian O'Conner's interview with Isiah Thomas on ESPN New York. For example, when asked if he hopes to replace Donnie Walsh whenever the Knicks president retires, Isiah answers, "Every single day of the week." (Before you start forming your protest, know that he'd later admit that this is a desire, not an expectation.) But Isiah's take on the LeBron James situation is particularly fascinating. LeBron James would have taken his talents to the white lights of Broadway, not the white sand of South Beach, if Isiah Thomas had anything to do with it. "I have to believe that," Thomas said, "because that was my plan. So I stick to it." Hired as president of the Knicks in December of 2003, Thomas said he targeted James as the centerpiece of a future title winner in New York "from the first day he got in the league, as soon as I got the job." So what you witnessed during the entirety of the Isiah Thomas era was Isiah's attempt to eventually land LeBron. It's possible this information actually makes him a worse executive than previously thought. So what did this plan involve? Thomas guessed James would ultimately sign an extension with Cleveland that would keep him with the Cavaliers through 2010, but went about acquiring players he thought would appeal to LeBron, anyway. Eddy Curry and Jamal Crawford, for instance. "They were just all friendly, and they were all on the AAU circuit," Thomas said. 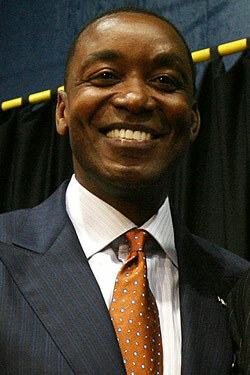 Said Isiah, and this is a real quote: "That's a problem with being a visionary. You're way too far out, and by the time it catches up, people will hack you to death."